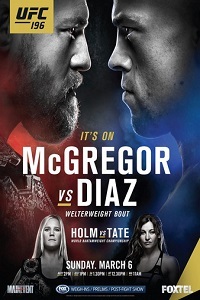 UFC 196: McGregor vs. Diaz (formerly UFC 196: Dos Anjos vs. McGregor, UFC 197: Dos Anjos vs. McGregor) took place on March 5, 2016 at MGM Grand Garden Arena in Las Vegas, Nevada. Click the stars to rate how good you think UFC 196 was. • Conor McGregor vs. Nate Diaz: Nate Diaz def. Conor McGregor via submission (rear-naked choke) at 4:12 of Round 2. • Holly Holm vs. Miesha Tate: Miesha Tate def. Holly Holm via submission (rear-naked choke) at 3:30 of Round 5. • Ilir Latifi vs. Gian Villante: Ilir Latifi def. Gian Villante via unanimous decision (30-27, 30-27, 30-27). • Corey Anderson vs. Tom Lawlor: Corey Anderson def. Tom Lawlor via unanimous decision (30-27, 30-27, 29-28). • Amanda Nunes vs. Valentina Shevchenko: Amanda Nunes def. Valentina Shevchenko via unanimous decision (29-28, 29-27, 29-27). • Siyar Bahadurzada vs. Brandon Thatch: Siyar Bahadurzada def. Brandon Thatch via submission (arm triangle choke) at 4:11 of Round 3. • Marcelo Guimaraes vs. Vitor Miranda: Vitor Miranda def. Marcelo Guimaraes via TKO (strikes) at 1:09 of Round 2. • Jim Miller vs. Diego Sanchez: Diego Sanchez def. Jim Miller by unanimous decision (29-28, 29-28, 29-28). • Jason Saggo vs. Justin Salas: Jason Saggo def. Justin Salas via TKO (ground and pound) at 4:31 of Round 1. • Julian Erosa vs. Teruto Ishihara: Teruto Ishihara def. Julian Erosa via TKO (strikes) at 0:34 of Round 2.